institution attached to the Ministry of Economic Affairs and Competitiveness. As a result of the BPM project, ICO gained an important competitive advantage, perceived as the only credit entity that reacted with agility to the Spanish financial crisis. Many Spanish SMBs face bankruptcy, affected by frozen credit lines following the global financial crisis. ICO, funded by the Spanish government, conceives the idea of the “Financial Facilitator”: an analytical credit application tool designed to get the cash flowing for hard-hit businesses. 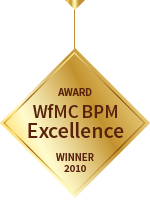 Bizagi and credit process experts, PwC, designed & delivered the complete BPM solution in record time.